Maria Callas was one of the great coloratura sopranos (female vocalists who specialize in an elaborate form of opera singing) of the twentieth century. She revitalized opera and increased its appeal because of her dramatic skill. By most accounts Maria Callas was born Maria Kalogeropoulos in New York City, New York, on December 3, 1923, just four months after her parents, George and Evangelia (Litza) Kalogeropoulos, arrived in New York harbor after moving from Greece. Callas was formally baptized Cecilia Sophia Anna Maria. It was around the time of her birth that her father shortened the family name to Callas. By the time she started school, Maria Kalogeropoulos was known as Maria Callas. At age seven Callas began her musical studies by taking piano lessons. She loved opera music even as a youngster, and she had a beautiful voice. She especially loved to sing La Paloma. She took great comfort in listening to the many opera records in her family's collection. Young Callas soon discovered that she had a natural talent and a flair for the dramatic. She won several amateur talent contests while she was in elementary school, and she was a popular performer on children's radio shows. When Callas graduated from the eighth grade in 1937, her mother decided to return to Greece in order for Callas to receive voice training in the classical tradition. She was a dedicated student, driven by a spirit of excellence. Callas's teachers, and later her directors and producers, were continually amazed at her exceptional memory. She easily learned music and lyrics in a matter of days, where others would require weeks or months. 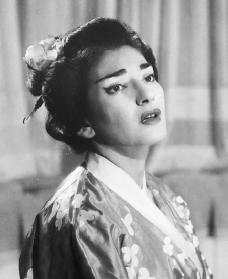 After World War II (1939–45; when Germany, Italy, and Japan clashed with European and American forces), her music coach, Elvira de Hidalgo, encouraged Callas to move to Italy to establish her career. Her Italian debut, held on August 3, 1947, was a performance of La Gioconda at the Verona Arena. She went on to perform Tristan and Isolde and Turandot in Venice, Italy, in 1948. She sang the title role in Bellini's Norma, her most popular role, for the first time in Florence, Italy, in 1948. Critics took note, and her career began to soar. Almost immediately upon her arrival in Verona, Italy, in 1947 she married Giovanni Battista Meneghini, a wealthy Veronian industrialist. Meneghini withdrew from his business interests to manage Callas's promising career, and generally devoted his life to fulfilling her every need. During the late 1940s and 1950s Callas toured Argentina, Mexico, and Brazil. She worked with famed Maestro Tullio Serafin, as well as noted directors Franco Zeffirelli (1923–), Francesco Siciliani, and Luchino Visconti. Callas's United States debut was at the Lyric Opera of Chicago (Illinois) in 1954. On October 19, 1956, she debuted at the New York Metropolitan Opera (the Met), where she performed in Norma. Coinciding with her Metropolitan Opera debut, Callas was featured on the October 27, 1956, cover of Time. During the peak of Callas's career she easily fit the stereotype (an oversimplified version) of a portly and highly emotional opera singer, but in 1952 she experienced a dramatic weight loss. By 1954 she was sixty-five pounds lighter. She continued to perform, and her career exploded into greatness. She added new operas, including Madame Butterfly, which she had previously avoided because she felt awkward and ungraceful. During the late 1950s the vocalist's personal life began to deteriorate, and this tragically affected her career. She had an affair with powerful businessman Aristotle Onassis (c. 1900–1975), and she and her husband separated in 1959, divorcing finally in 1971. Onassis eventually divorced his wife, Tina, but married Jacqueline Kennedy (1929–1994), widow of the late president John F. Kennedy (1917–1963), though he also remained involved with Callas. The intrigues of Callas's personal life soon overshadowed her professional life. The stresses of jet-set living, as well as the strain she had put on her voice throughout her career, began to take their toll. A series of high-profile cancellations continued her downward spiral. Although she returned briefly to perform at the Met between 1964 and 1965, she never resurfaced as the great talent of her youth. Callas died unexpectedly in Paris, France, on September 16, 1977, shortly before her fifty-fifth birthday. Just as no record exists of Callas's birth, her death also remains shrouded in mystery, the cause of her death never fully explained. Bret, David. Maria Callas: The Tigress and the Lamb. New York: Robson Books/Parkwest, 1998. Stassinopoulos, Arianna. Maria Callas, The Woman Behind the Legend. New York: Simon & Schuster, 1981.